In quite a fitting turn of events, while a historic March heat wave continued to engulf the Midwest United States for a tenth consecutive day, President Obama made a campaign stop in the oil town of Cushing, Oklahoma. He stopped by to tout his administration’s record on fossil fuel extraction. Cushing will be at the northern end of a section of the controversial Keystone XL pipeline which is slated to be constructed in the South of the United States. Obama is now saying the pipeline is “a priority” for his administration in the face of Republican criticism he’s not doing enough to try and reign in high gasoline prices. As I’ve said in a previous post about the current U.S. heat wave (see March Heat Wave Is One Of The Most Extreme Heat Events In US History), eminent climate scientists such as Dr. James Hansen have pointed to recent occurrences of heat waves being more intense because of global warming. Now, considering climate scientists are telling us extracting and burning fossil fuels at the rate we are is causing global warming, including more intense heat waves, please, someone tell me why the president of one of the biggest greenhouse gas emitting countries is wanting to drill from more fossil fuels “all over the place”? And what’s more, he’s supposed to be a “progressive” president. It seems like utter madness to me. 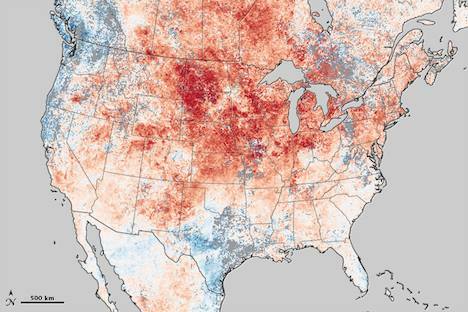 Image courtesy of NASA: Temperature map of of the US, 15 March, 2012. Mid-summer in March. Thank you for the article John. all this is actually utter madness indeed, and deeply concerning. Obama no better. Thanks Julien. Yes it just seems so far from where they need to be, and the other lot would no doubt be worse, in terms of extracting fossil fuels. They are all for the Keystone XL Pipeline.